This beautiful model is from the book, Fujimoto World - Twist Fold, ISBN 978-4416312001. I'm not sure which is the real name that the model is given in book (I think I will have to learn Japanese! ), but it looks like a series of stars. 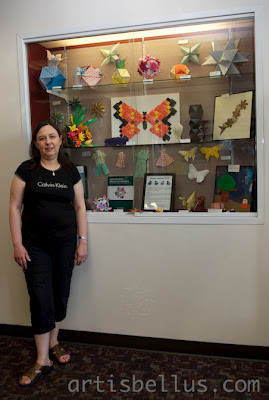 The model was folded with a 5" x 28" (125 mm x 700 mm) rectangle of kraft paper. 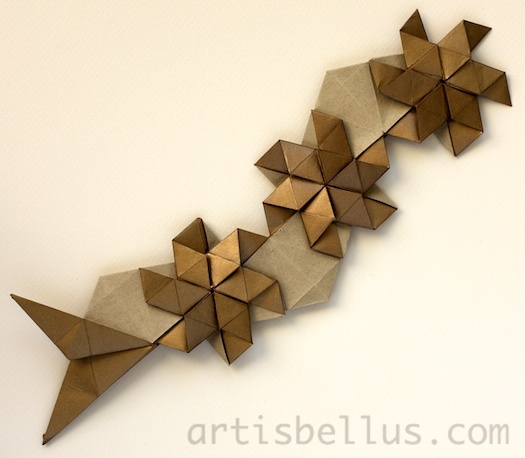 It starts by folding a 60º grid. I took me a while to figure out how to collapse each star, but it was a fun challenge and I liked the end result a lot. For future reference, if you happen to have the book, and you know how to read Japanese, please leave me a comment with the name of the model. Is there a better way to relax on a Sunday afternoon than having a cup of coffee and a mini chocolate cake? Yes, of course... Folding them! Cup, created by Shuzo Fujimoto, folded from a 12" x 6" (300 mm x 150 mm) rectangle of scrapbook paper. The instructions can be found in the book, Fujimoto World - Twist Fold, ISBN 978-4416312001. 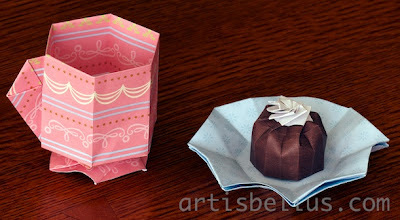 Chocolate cake, created by Yoshihide Momotani, folded from a 6" x 3" (150 mm x 75 mm) rectangle of scrapbook paper. 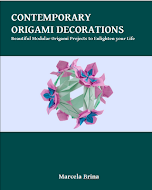 The instructions can be found in the book, Cute Origami, ISBN 4416303017. Saucer, created by Yoshihide Momotani, folded from two 6" (150 mm) squares of scrapbook paper. The instructions can be found in the book, Doll's House with Origami, ISBN 4416303017. 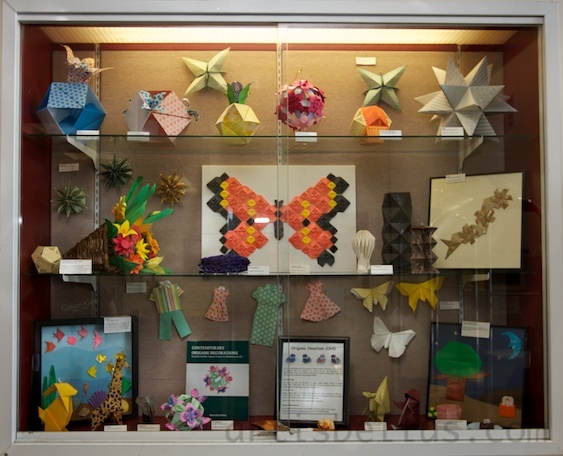 This beautiful modular is from the book Origami New Discovery II, by Kunihiko Kasahara, ISBN 9784817080868. I'm not sure about the name of model, as the book is in Japanese. I liked it because each side looks like a rose. 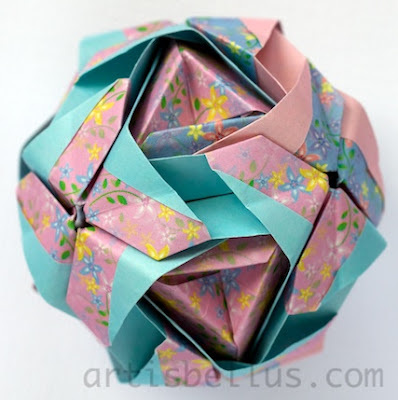 It consists of 12 units that are very easy to fold and assemble. 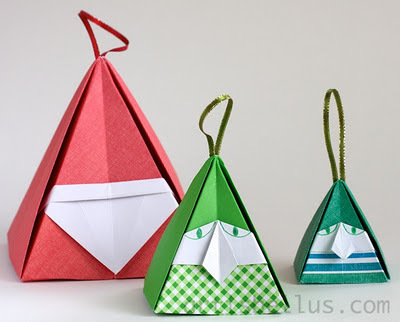 I folded each unit with a 3" (75mm) square of duo origami paper, solid color on one side and patterned on the other.